Laurie (Barclay) Collett is a retired MD neurologist and now a medical writer/journalist. She was formerly a soloist with the Philadelphia Civic Ballet, as well as an accomplished figure skater. She teaches a ladies' Bible study class at Fellowship Baptist Church and is active in music ministry. Richard and Laurie Collett are ballroom dance champions, performers, and owners of Rhapsody Ballroom, Tampa, FL, as well as certified adjudicators in all styles of ballroom dancing. They are undefeated US Amateur Open to the World Theatrical Champions from 1999-2003 and US Amateur National Cabaret Champions from 2002-2003. As professionals, their innovative choreography, showy and musical style, and dramatic portrayals of inspirational, classical and popular themes have brought them many invitations to perform both nationwide and abroad. Richard Collett is a retired Chief Petty Officer in the Navy and currently a real estate manager, He operates and manages Rhapsody Ballroom, a public ballroom in Tampa. He is an accomplished and entertaining Master of Ceremonies for dance and other events. Richard is a head usher at Fellowship Baptist Church. 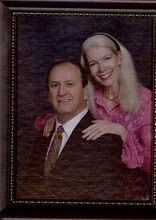 You can email Richard & Laurie at info@collettpraisehimwithdance.com.